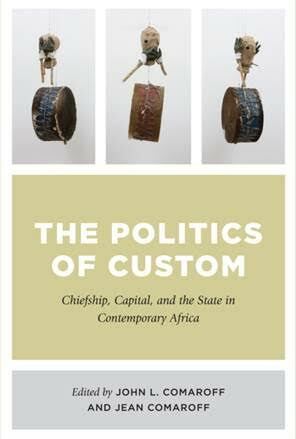 How are we to explain the resurgence of customary chiefs in contemporary Africa? Rather than disappearing with the tide of modernity, as many expected, indigenous sovereigns are instead a rising force, often wielding substantial power and legitimacy despite major changes in the workings of the global political economy in the post-Cold War era – changes in which they are themselves deeply implicated. This path breaking volume, edited by anthropologists John L. Comaroff and Jean Comaroff, explores the reasons behind the increasingly assertive politics of custom in many corners of Africa. Chiefs come in countless guises – from university professors through cosmopolitan businessmen to subsistence farmers – but, whatever else they do, they are a critical key to understanding the tenacious hold that ‘traditional’ authority enjoys in the late modern world. Together the contributors explore this counterintuitive chapter in Africa’s history and, in so doing, place it within the broader world-making processes of the twenty-first century. appeal to a broad audience.— James Ferguson, Stanford University.